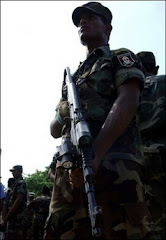 At least four civilians were killed by a group suspected to be LTTE in Maha Willachchiya, a boarder village in Anuradhapura district as LTTE supremo marks his 53rd birthday today. "Bullets ridden bodies, including a female were found at around 08.45am,all were farmers according to villagers",a senior military official said. Army has started cordon and search operation in the area and hundreds of heavily armed soldiers seen in the area, residents said. "Ellage Hemapala and Leelawathi Podi Manike were husband and wife, who were also traditional farmers like the others killed today (26)", Mahawilachchiya Police said. Similarly 05 civilians were killed in two different incidents in Ranminithenna,a boarder village near Yala National Park early this month. Security forces have arrested at least 08 persons regarding those incidents and all are Sinhalese, police sources said.